It's been some time since I played around with glass, but I wanted to show that side of my work here on Release the Craftin'. 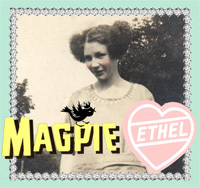 After the holidays, I hope to get back into it -- I have tons of ideas and many, many supplies. 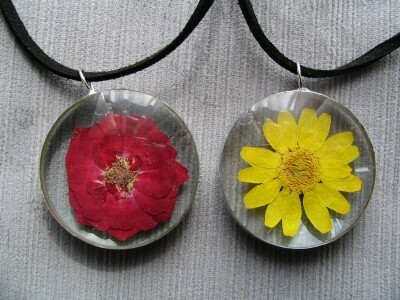 These were some flower pendants that I made a while back. I purchased pressed flowers (now I would probably try to use my own from my garden -- but this was back in the pre-garden days.) I think the purchased pressed flowers have a bit of color added to them to really make them pop. 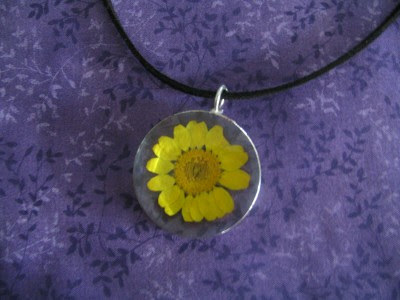 Here's a shot of a yellow daisy type of flower in glass bevels. And another shot with a rose, also in glass bevels. I use lead-free solder for all of my jewelry pieces. I used faux suede cords, which are fun. But I'd like to come up with another option. Ideas? Thoughts? What kinds of cords or chains do you like for your jewelry? Leave me a note in the comments below!